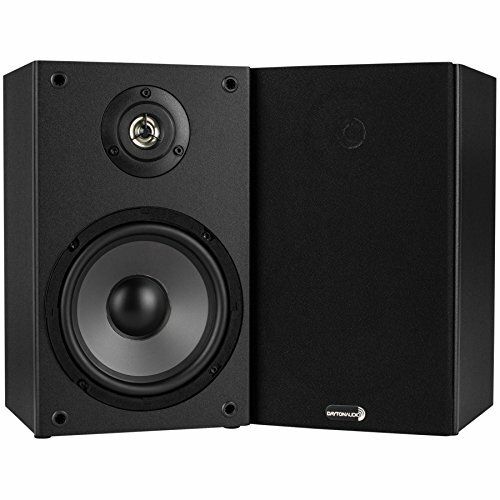 Dayton Audio's B652 two-way bookshelf speaker is perfect for offices, dorm rooms, apartments, or any other living area. Measuring under 12-Inch tall, these small but mighty speakers will never overwhelm the decor in any room. The B652's two-way design features a 6-1/2-Inch polypropylene cone woofer and a 5/8-Inch polycarbonate ferrofluid cooled dome tweeter to accurately reproduce audio from 70 to 20,000 Hz. Installation features include quick connect speaker terminals, key-hole hanger and removable grill. These small, powerful speakers make a great addition to any living space. Packaged and sold in pairs. Includes two 9-1/2 foot long 20 AWG speaker cables. Specifications: ; Woofer: 6-1/2-Inch polypropylene ; Tweeter: 5/8-Inch polycarbonate ferrofluid cooled ; Power handling: 40 watts RMS/75 watts max ; Impedance: 6 ohms ; Frequency response: 70-20,000 Hz ; Sensitivity: 87 dB 1W/1m ; Dimensions: 11-13/16-Inch (H) x 7-1/16-Inch (W) x 6-7/16-Inch (D) ; Sold in pairs.